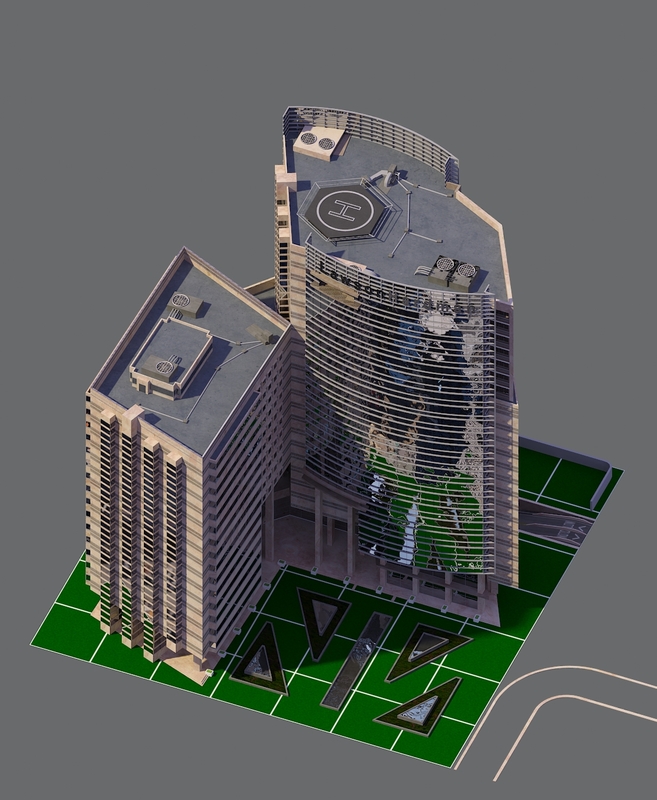 Realistic building scaling? In my C&C? 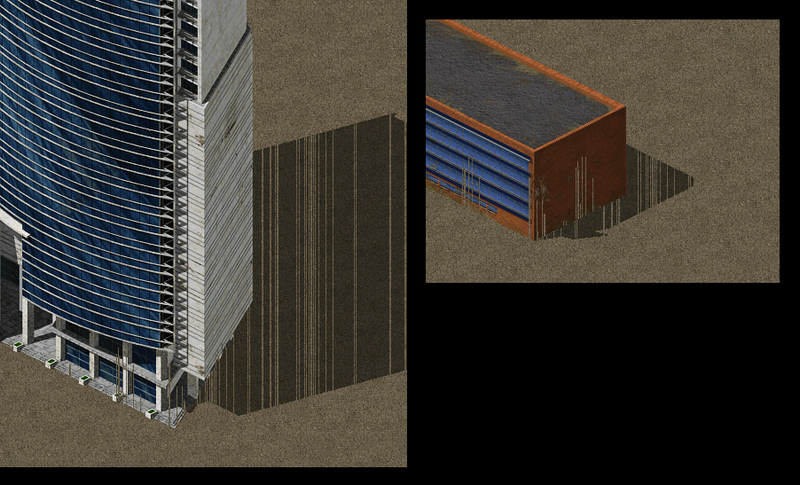 Layering issues with objects behind the building being displayed in front. If the buildings "foundation" isn't on/near the screen then it wont render the building even if the building is tall enough to fill several screens etc. 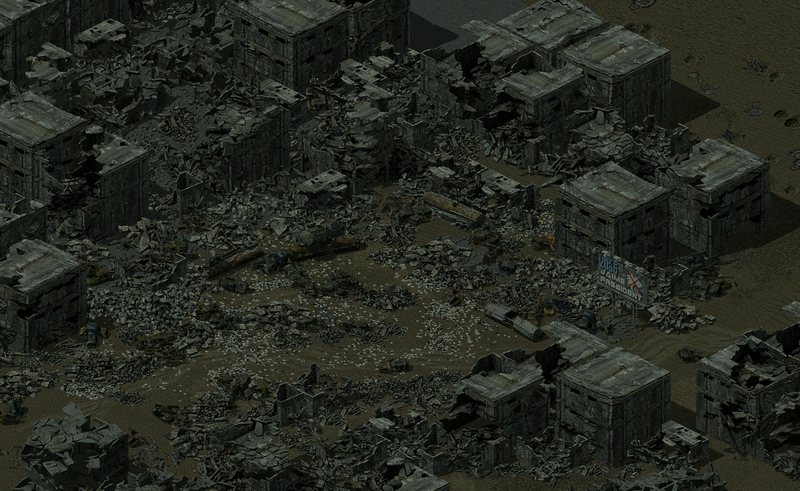 There is a size limit to how big a building shp file can be, to get round this I've used an animation for the buildings graphics instead but then garrison or rubble frames don't work. I'm curious to know if you have also experienced any similar problems? -problems with the foundation and "z adjust"
this tiberium is only for GC, but well... hey ARO, this tiberium is nice for TI? 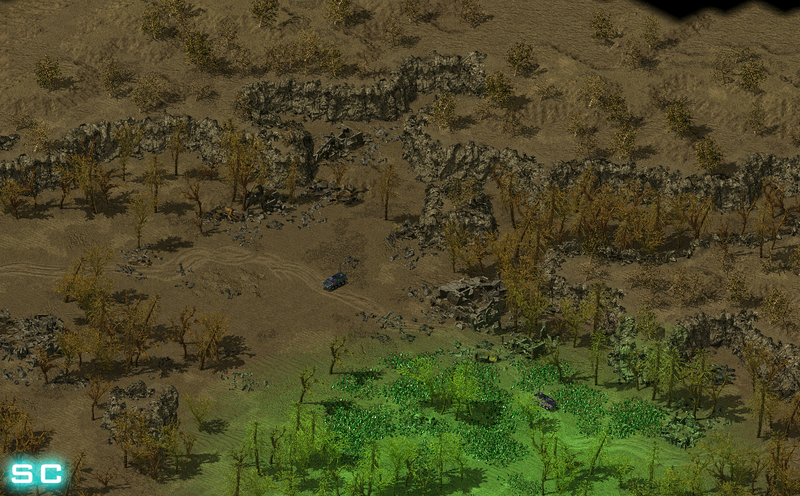 Tiberium+particles (gas) is beautiful but is heavy for the game. After seeing again how small your infantry are. Wouldn't it be okay to at least increase their size to something at least 65% Size (10% Smaller TS Infantry and 35% Smaller for RA2) since atm they look tiny... even compared to the RA1/TD/D2K Infantry. This mod looks good though! Holy frack, now that's what I call eye candy! Half a foot is roughly a pixel. I'm a bit worried on how effective using infantry would be in large scale battles. If they're too small its gonna be almost next to impossible clicking them when all the fancy explosions and movements are happening in-game. 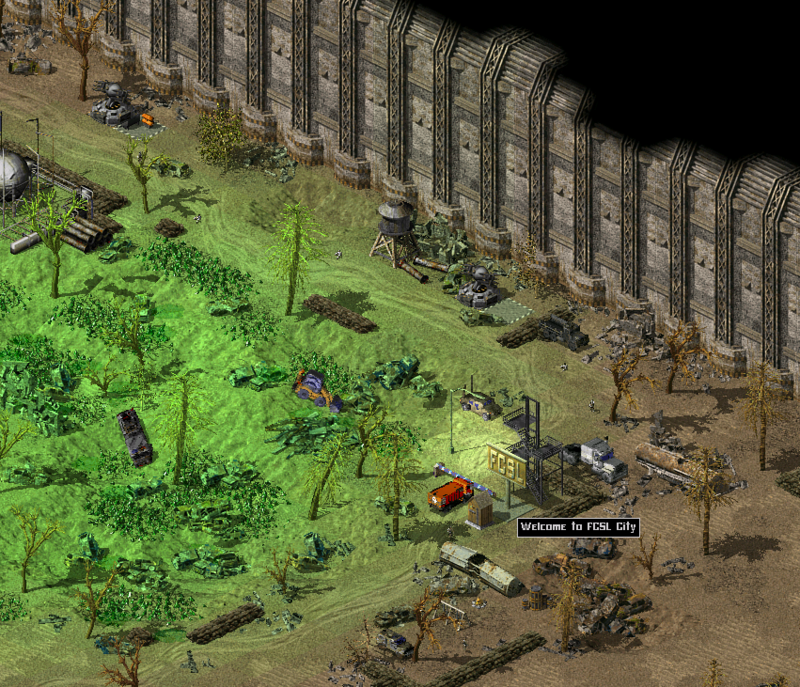 The Tiberium is ace and so are the buildings but I really wanna help you out that infantry should be at least a bit bigger as right now you'd need to have precision clicking or play the game on 640x480 just to be absolutely sure you won't miss on clicking them. Still though if that's the case might as well just make them 2x5 pixel sticks. The loss of detail with them so small just makes this the case. 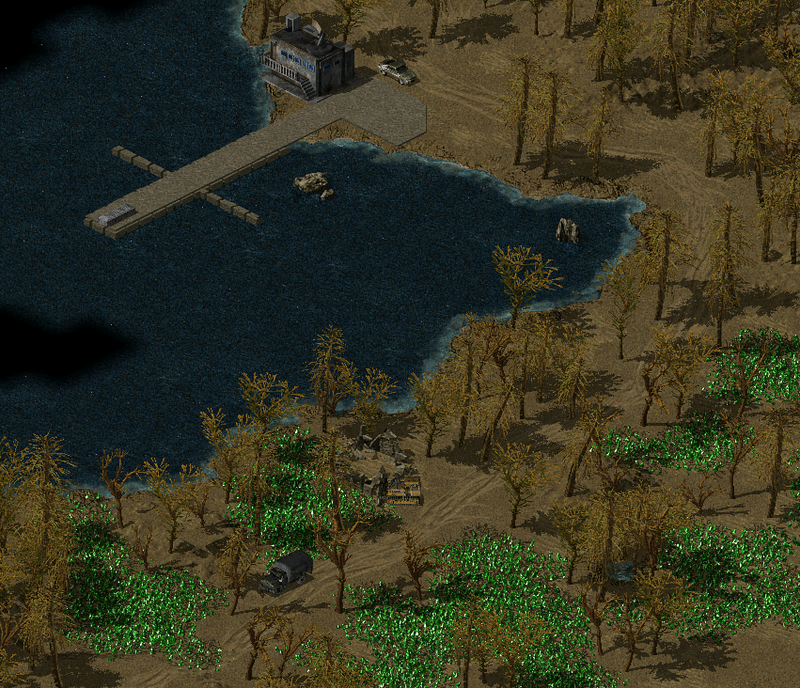 This is one of the cities of the yellow zone, the tiberium is little, also the presence of humans and animals... but the "tiberium" is a mutator of new forms of life for this ghost cities. Good work, Harry. Everything looks great. I'm a little bit late, but yes. I just checked all the images and the terrain is some excellent work. Only the player buildings could look a bit smoother. The civil buildings look nice (too bad the engine is unable to hide alphalights behind big objects). I like all the random debris/doodads/rubble and other stuff. I am absolutely astounded by all this work, is this all you? And the quality is amazing! My only complaint so far is the small size of the infantry. I completely understand where you're coming from though as I used to feel the same way, but I think it would be better to have them TS sized. C&C has weird scales so everything can be easily interacted with. thanks... I love work the enviroment of a post apocalyptic world.. 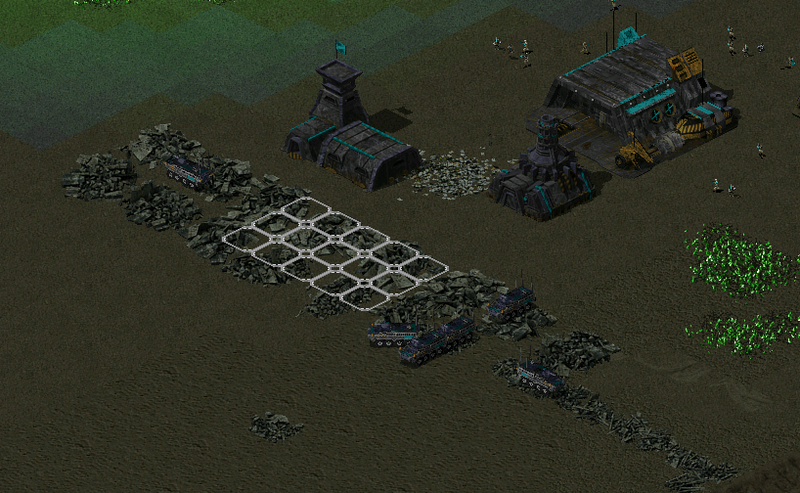 I only fear such an amount of rubble and debris can cause quite some gameplay trouble. Imagine a sniper hidden somewhere in this. Due to your tiny infantry, it would be a pain to find this unit. 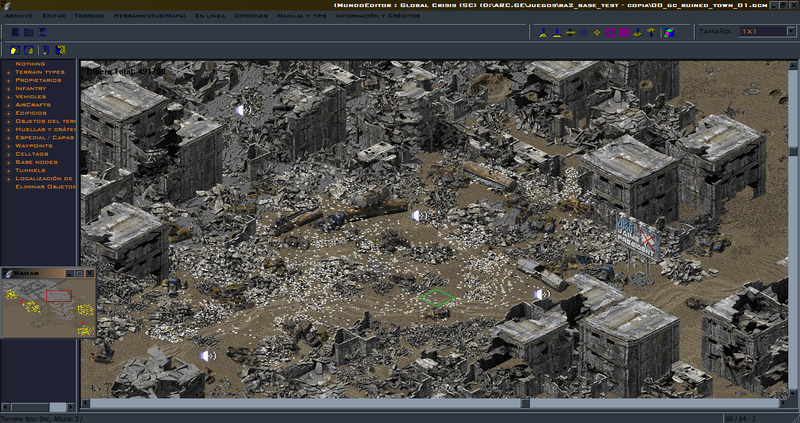 Maybe you try to set up the rubble as deformable terrain or destroyable Overlays, so some heavy firepower can completely level the ground and make it possible to "clean up" the area. you could create a special scanner unit, which fires a dummy weapon on infantry only, that creates on the target a well visible target cursor. 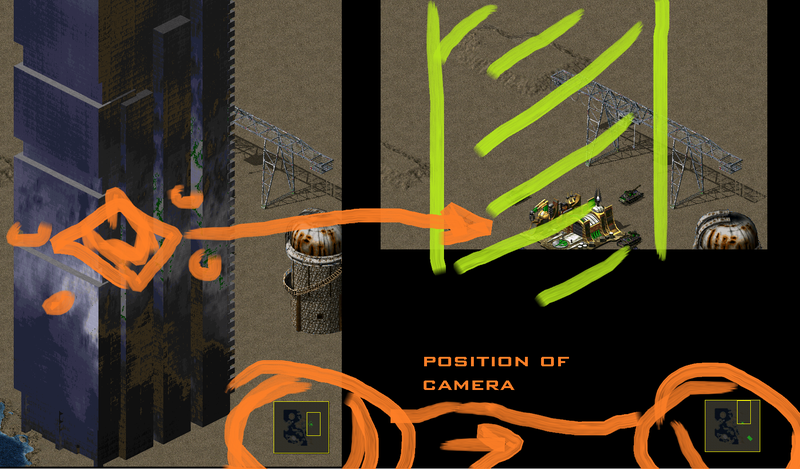 So a player gets better visible feedback of infantry in the area. 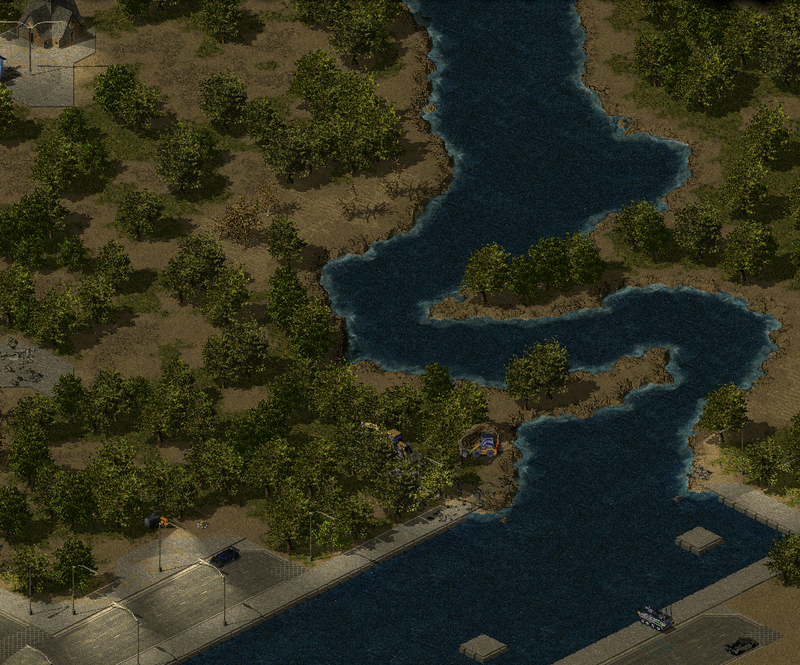 HG_SCIPCION this mod looks good, the shorelines look great and really great atmosphere overall! 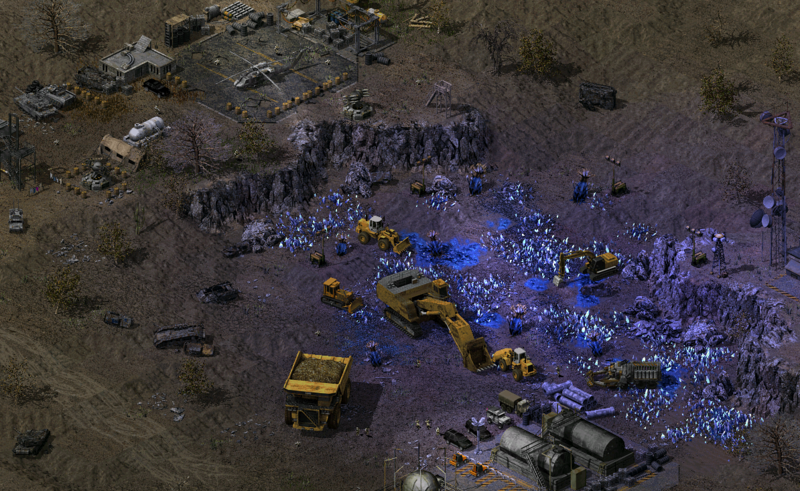 I wonder if OpenRA would be a good long term option ? 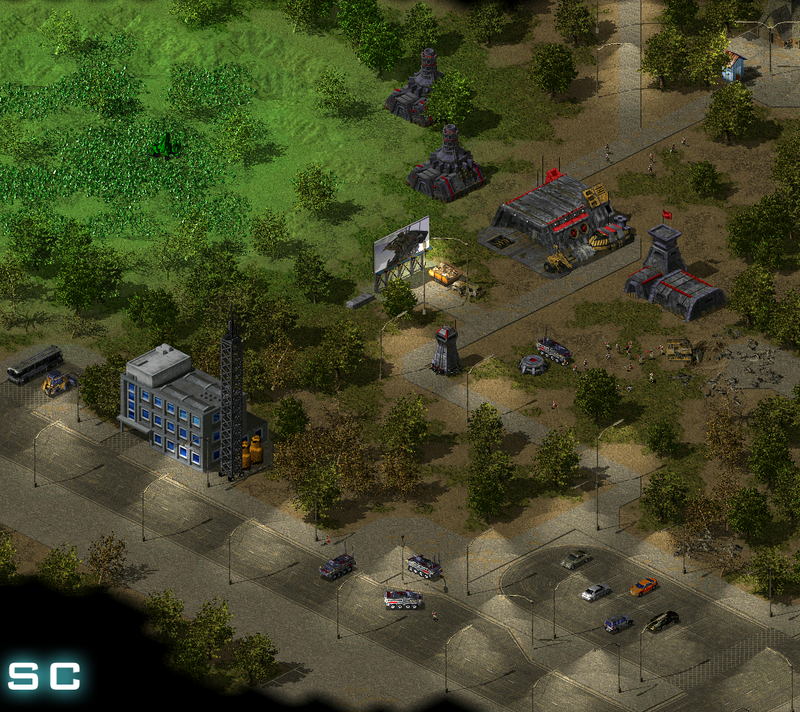 only fear such an amount of rubble and debris can cause quite some gameplay trouble. Imagine a sniper hidden somewhere in this. Due to your tiny infantry, it would be a pain to find this unit. He already has an OpenRA project. This is like his original project. This is all very awesome, that town looks creepy and dead. Except for an odd scavenger or three. Makes the radar more useful too. I think that many players are not using it. I for one can't play well without it. I don't like scrolling all over ze place.